As I mentioned a couple of days ago, the stalwart patriot who burned pages of the Koran at Ground Zero on 9-11 was fired from his job at the New Jersey Transit authority. The protester who burned pages from the Koran outside a planned mosque near Ground Zero has been fired from NJ Transit, sources and authorities said Tuesday. Derek Fenton’s 11-year career at the agency came to an abrupt halt Monday after photographs of him ripping pages from the Muslim holy book and setting them ablaze appeared in newspapers. Fenton, 39, of Bloomingdale, N.J., burned the book during a protest on the ninth anniversary of Sept. 11 outside Park51, the controversial mosque slated to be built near Ground Zero. Of course Chris Dunn of the NYCLU is correct under US Constitutional Law, but not under Islamic (Sharia) Law, where such “blasphemous” acts have always been punished lethally, including within mythically enlightened Muslim Spain. 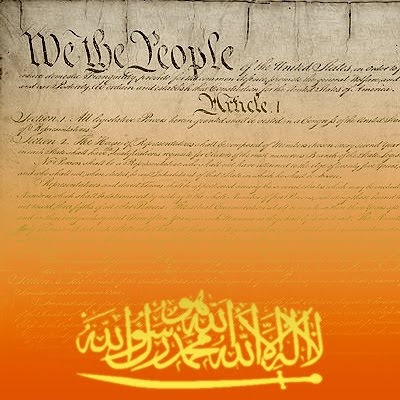 Indeed, as I noted at The American Thinker in February, 2008, the global Muslim umma, as represented by its unique 57 member nation religio-political body, the Organization of the Islamic Conference, the largest voting bloc in the United Nations, is seeking to overturn human rights constructs like our Bill of Rights, and impose Islamic blasphemy law, internationally. The cultural relativist self-loathing in our society that abets this process — as exemplified by the NJ Transit’s firing of Mr. Fenton — smacks of the submissive dhimmi mentality Islam imposes with the ongoing threat of violence upon non-Muslims living under the Sharia. Mr. Fenton should sue. I don't see how the NJ Transit would have a legal leg to stand on. My thoughts exactly. Would it be expensive for him or could he get legal aid (if there is such a thing in the states)? Heck, I'd donate to his legal fund. It wouldn't be a lot, but I'm happy to help. In the UK he could take them to an industrial tribunal and force them to either give him his job back or to financially compensate him or loss of earnings. With an open and shut case like that, no doubt he can get a contingency lawyer. I would like to know who "asked"
New Jersey Transit to fire him. Some New Jersey Transit muslim worker ? laine: Mr. Fenton should sue. I don't see how the NJ Transit would have a legal leg to stand on. If Fenton's employment contract contains a "morals clause" which specifically covers off-hours activities, his termination may be legally supportable. This does not change how morally insupportable it is to punish a person's non-violent, conscientious objection to the Qur'an and its anti-Constitutional doctrine. Voluntary compliance with shari'a law must be viewed as complicity with Islamic terrorism. I think the American visitors to this site should get accustomed to this tactic. To your north this punishment has been an active tool against enemies of the multi-cult for decades. If you think your Constitution is a safe guard don't be fooled. In Canuckistan we have a Charter of "rights" and "freedoms" and it isn't worth the paper its printed on. As you travel farther down the relativist rabbit hole your countries "rights" will be ever increasingly incoherent until noone will be able to define the term Freedom. I've covered that on my own blog for quite some time, as have some great Canadian bloggers, such as Blazing Cat Fur and Ezra Levant and Kathy Shaidle (Five Feet of Fury). I suggest you start up your own version of the Tea Party in Canada, if you haven't already. We don't have a copyright on the idea in the US!